These have been going on for quite some time now and they deserve lots of support. The NHI (National Hospitality Institute) provide a range of training courses for people looking to work in the hospitality sector. As a sort of coursework, the students put on these Gourmet nights every couple of months. Its quite far away still, on Wednesday 9th May, but the next Gourmet night is scheduled to take place at the Marina Bandar al Rowdha from 7:30pm. To give you an idea of the calibre of the graduates from nhi, just take a walk through the kitchens of the newly opened Kempinski at Al Mouj and you'll find a number of nhi trained staff there. So, for a chance to eat a fancy dinner, at a price of RO 26 a head (including paired wines) it shapes up for a great date night option! 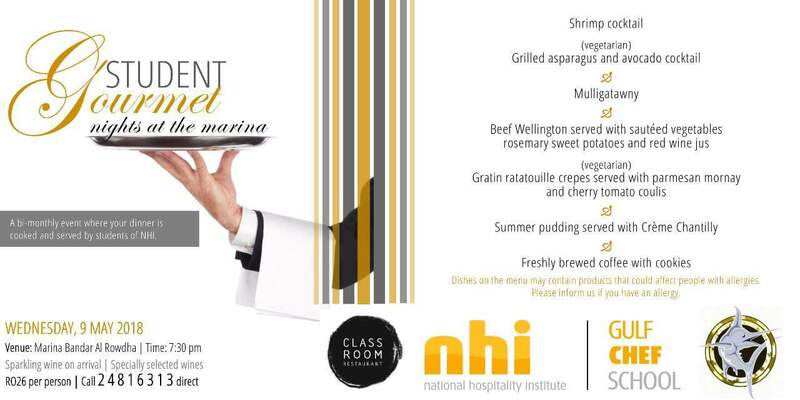 To make a reservation then call nhi on 2481 6313.